In a year where the election will no doubt shape the future of our judiciary, it seems our courts will be shaping the election. As was the case in Florida in 2000 and Ohio in 2004, election officials might very well challenge voter eligibility in the courts. But this year, the Ohio Republican Party (ORP) appears to be getting an early start. When you’re running behind in the polls, disqualifying new voters must seem like a brilliant strategy. Of course, pesky legal issues always seem to get in the way. Earlier this month, the ORP, alarmed by massive registration of new Democratic voters, filed a suit in federal district court demanding a list of these new voters so that ORP could challenge their validity. Ohio Secretary of State Jennifer Brunner objected, concerned that allowing local parties to challenge voter eligibility so close to the election (they were already given two years to do so) might mean the disqualification of thousands of perfectly legitimate votes. The district court sided with the ORP, but Ms. Brunner appealed to the Sixth Circuit. This is where the story gets interesting. 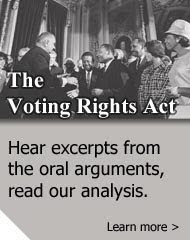 The original three-judge panel that heard the case sided with Ms. Brunner, arguing that interference in state election matters would risk voter suppression. They also questioned whether local parties like ORP were even eligible to bring these kinds of suits. 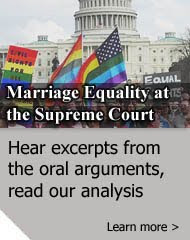 But, the Sixth Circuit's conservative majority, dissatisfied with the panel’s decision, granted an en banc hearing in which they reversed the panel decision and supported the ORP’s claim. As we noted yesterday, the majority of the judges sitting on this court were appointed by Republican presidents (ten of the 16 to be exact) and one of the judges actually has a spouse running for reelection on the Republican ticket. But it seems Ms. Brunner has no intention of giving up so easily. News broke today that Ohio’s attorney general has filed a motion in the Supreme Court on behalf of Ms. Brunner asking the Court to reconsider the Sixth Circuit’s decision. According to reports, Justice John Paul Stevens, who handles cases from the Sixth Circuit, is considering the case. We certainly hope the Court agrees to hear it, but are far from confident about the outcome, particularly considering President Bush’s appointees, Justices John Roberts and Samuel Alito, who have already shown their willingness to decide cases on partisan ideology. And, of course, we all remember what the rest of the conservative justices did in a little case from 2000.